Coined in the early 1920s, a “blue-collar” professional performs manual labor, often at an hourly wage. Many blue collared jobs demand highly skilled workers, such as plumbers, electricians, and plant operators. However, there are also many low skilled or unskilled positions, like custodial or assembly line work. Good news for those interested in manual labor: these jobs aren’t going anywhere. In fact, by 2024, the Bureau of Labor Statistics (BLS) predicts a 7% job growth rate for all occupations and a 10.1% growth rate for construction jobs. There is a myriad of great positions out there across a range of fields. 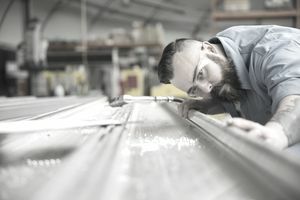 Although blue-collar jobs do not require a bachelor’s degree, you must receive formal training and apprenticeships to qualify for highly skilled occupations. Be sure to list and describe any skill training, apprenticeship, certification, or licensure you have received on your resume or online application and mention it in interviews. Even if you haven’t held a blue-collar job, you may have acquired some critical skills through a hobby, volunteer work, sports participation, auto repair, etc. Are you certified in CPR for coaching basketball? Include it. Consider the soft skills you have developed as well. Being adaptable, an effective communicator and compassionate are just some of the traits that employers look for in candidates. So, don't limit yourself to emphasizing hard skills alone – include the personality traits you have developed at home, at church, or in pursuing your interests. Blue collar employees work in a variety of settings under a myriad of conditions based on environmental factors. From factories to farms, these sites are very vulnerable to weather conditions. High-speed winds cause an electrical shortage, and you are on a 5 p.m. deadline for your client. What needs to happen to ensure your team meets it? There is almost always a resolution to these sorts of issues. Those who stay calm, think outside the box and take initiative often find it. Also, employees who effectively manage conflict and solve problems enjoy more upward growth. So, if you have demonstrated these highly sought after traits in the past, highlight them on your resume and in your interview. Even if you lack some skills, remember that many companies will train their employers will always hire the most qualified, dynamic applicants. Your application and resume should reflect that. Review the job posting in detail and list your experience and talents applicable to the position itself. This list provides many in-demand blue-collar occupations in manufacturing, building trades, construction, and other sectors. For information regarding the skills necessary to qualify, simply click on the trade. It can be helpful to take inventory of your skillset by reflecting on past jobs, both paid and unpaid as well as life experience. Answer the following questions to give you a better sense of your skills and any gaps you should address. You'll also be better equipped to build out your resume. What machines have you operated? What computerized equipment have you used? What programs or apps have you used? What machines and electronics have you repaired? What machines and electronics have you maintained? What safety equipment and procedures did you use on the job? What quality control steps did you use on the job? What problems did you solve on the job? Have you worked outdoors? In what capacity? In what weather conditions and temperatures have you worked? Have you worked in a shop or factory setting? What skills did you develop? Have you worked in client homes or client businesses? In what capacity? Which, if any, of your past jobs required good hand-eye coordination? Which, if any, of your past jobs, have required strong physical balance? What kinds of loads have you lifted, moved or carried? What, if any, equipment did you use? Have you communicated with customers or clients on the job? How integral was it to your work? Have you worked as an individual or part of a team? Describe what duties you carried out individually versus on a team. Do you have experience managing or supervising other workers, interns or apprentices? What leadership skills did you bring forward (i.e., delegating, problem-solving, managing conflict)?